Filtering a Victorian-era morality tale through an early Renaissance prism results in one of the most relevantly modern productions of A Christmas Carol I’ve ever seen. 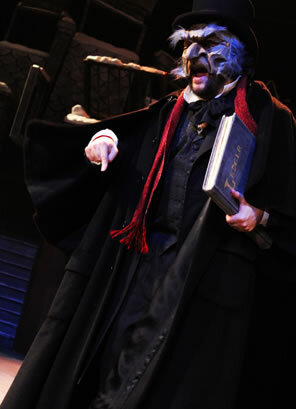 Faction of Fools Theatre Company, Gallaudet University’s Elstad Auditorium, Washington, D.C.
Paul Reisman as Scrooge in A Commedia Christmas Carol. Photo by Second Glance Photography, Faction of Fools. Yet another theater is doing yet another Christmas Carol for the holiday season. But as this is not your typical theater company but the Faction of Fools, specialists in the Italian Renaissance theatrical art form known as Commedia dell’Arte, A Commedia Christmas Carol is a completely new (or, if you will, really really old) take on Charles Dickens’ never-time-worn tale of Christmastime redemption. Ironically, filtering a Victorian-era morality tale through an early Renaissance prism results in one of the most relevantly modern productions of A Christmas Carol I’ve ever seen. This company has successfully staged Commedia versions of Shakespeare’s Romeo and Juliet and Hamlet in the past year, so taking on Dickens’ Christmas classic seems an easy leap. Still, the company’s founding artistic director, Matthew R. Wilson, who adapted and directed this production, makes a concerted effort to ground the Victorian-era tale in all the historical conventions of Commedia beyond the use of masks, stylized movements, and slapstick violence. He even adapts Dickens’ well-known characters to Commedia’s standard stock roles. Scrooge, naturally, is Pantalone, the miserly merchant, and Jacob Marley’s Ghost takes on the characteristics of Pantalone’s counterpart, the decadent scholar il Dottore. Fred and Clara serve as the Innamorati, the young lovers, while Bob and Mrs. Cratchit occupy the part of Arlecchino, the clever servant. At that level, though, the adaption of Commedia conventions seems more academic than theatrical, and the slotting of Dickens’ vividly written spirits into Commedia stock roles becomes an obligatory exercise with the depiction of the Ghost of Christmas Past as the sad clown Pierrot and Christmas Present as the braggart Capitano. If in this production Scrooge is the extremity of mean, the Cratchits are the extremity of poor. A horsefly is their Christmas dinner—after they catch it. The whole family tracking the fly is a clever bit of ensemble miming and roustabout action, ending with Tiny Tim knocking the fly down with his cane. However, it renders senseless Bob Cratchit’s insisting that the family give a toast to Scrooge for providing the employment that paid for their feast. Other slapstick sequences play more genuinely. Bob Cratchit (Joel David Santner) goes into a shivering fit whenever the door to Scrooge’s counting house is opened and every merry visitor forgets to close the door. The visit of Fred (Tyler Herman) results in Scrooge’s perpetually positive nephew accidentally beating Cratchit in a choreographed sequence of pratfalls. Scrooge and Marley’s Ghost engage in verbal calisthenics in the vein of Abbot and Costello when they pun on the term tense (the ghost is referring to past, present, and future tenses while Scrooge describes what he’s feeling). The author’s name was bound to show up in a pun, too, and on Christmas Day Scrooge gives the Cratchit girls a gift box containing something “every child should have.” It’s a ball. There’s more in that than a visual pun, especially as the play begins with Scrooge stomping on and deflating a ball that a couple of characters had been tossing back and forth with members of the audience. As much slapstick visual and verbal humor as this production contains, it’s also brimming with emotion and a serious streak of morality that, thanks to another Commedia convention of incorporating topical jokes into the action, skewers through our real-life headlines straight into our hearts. Wilson crystalizes Dickens’ past/present/future/still-present structure of the novella into a lesson of embracing the present. When Belle (Julie Garner) breaks up with Young Scrooge, Reisman’s current Scrooge tries to get his huge-headed younger self to speak all the things he wishes now he would have spoken then. The Ghost of Christmas Past (Santner) points out that Scrooge is watching the past, and it cannot be changed. Toby Mulford as the Ghost of Christmas Present stresses that he is a spirit of only the now, so he can only show Scrooge an unfiltered what is, not tempered by what will or even what could be. Upon the appearance of the Death-depicted Ghost of Christmas Yet to Come (Mulford again), Scrooge admits that this spirit frightens him the most, not because he fears his own mortality but because he simply fears the future. “I shall write a new future,” he says. Writing a future is something you do in the present. Dickens doesn’t give his Scrooge a new life. He doesn’t allow Scrooge visiting his past to rectify either the abuse visited upon him or the abuse he’s visited upon others, and in the unremitting silence of the Ghost of Christmas Yet to Come, Dickens refuses to give Scrooge an optional future. Notably, despite Marley’s Ghost telling Scrooge the spirits will visit him on successive nights, they all visit him, essentially, simultaneously. He wakes up in the now, and it is in the now and only the now that he can affect and thereby create a more prosperous future, not just for everybody but for himself, too: “A redistribution of mirth,” says a character in this production. Watch this show, or any production of this story, or read the original Dickens novella this week as we in America recoil from unimaginable tragedy and totter on the precipice of a fiscal cliff, and maybe you’ll find yourself wishing for the ghosts of Christmas past, present, and future to visit our political leaders—every single one of them—or at least force them to see this play or read this story. 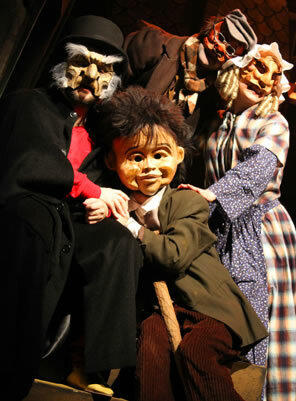 Clockwise from Scrooge: Bob Cratchit (Joel David Santner), Mrs. Cratchit (Julie Garner) and Tiny Tim (Michael Sprouse). Photo by Second Glance Photography, Faction of Fools. The actors play this serious streak in the story subtly, underneath the masks and the over-exaggerated gestures. Reisman shifts easily from caricature to character in his portrayal of Scrooge and finds real humanity in the man. We laugh at his meanness and could even hiss him openly for the way he treats everybody on Christmas Eve, but we ache for him as he futilely tries to alter his past with Belle. When the Ghost of Christmas Present takes him to Fred’s party, Scrooge plays along in the guessing game as Clara (Garner) depicts an animal. “I know this!” he says excitedly as he mimics her mimicking—him. With this realization, Reisman stops, and his angry eagle mask somehow emotes a deep deep sadness. It gets worse for him, but because of a kindness from an unexpected quarter: Fred, guessing Clara’s portrayal, protests that she is being too mean and then offers a toast to the uncle who hates him. Scrooge’s redemption is in Fred’s unconditional love, vividly played for us in Herman’s heart-truth portrayal of Fred, always genuine in his merry makeup whether he’s engaging in knockabout antics or being the pivot on which the play turns. Another standout performance is that of Garner who, in addition to Belle and Clara, plays Young Fan and Mrs. Cratchit, the latter in mask, wearing the rumpled dress of an overworked and ever-worried housewife, and speaking in a voice that comes straight from London’s hard-scrabble streets. We would never believe that Mrs. Cratchit and Clara are played by the same actress if Garner didn’t transition from the former to the latter right before our eyes while performing a continuous monologue, her voice changing even as she removed her mask and pulled off the housewife’s dress to reveal an elegant Victorian beauty in a ball gown. She then segues from Clara back into Mrs. Cratchit later, and the mere transformation inspires appreciative applause from the audience. At the end of this production, it’s not Tiny Tim who has the last word. Playing Tim is Michael Sprouse, a drama student at Gallaudet University, and he performs his role using American Sign Language. When he invites Scrooge to stay for dinner, Scrooge doesn’t understand him, so Cratchit interprets. Then, Tiny Tim signs his signature line, and teaches it to Scrooge. It is Scrooge—and Reisman plays him as if he’s not only still shaken by his phantasmal night but yet bothered by his past and fearing the future—who turns to the audience, signing and speaking, “God bless us, every one.” There can hardly be a dry eye in the house. In this tableaux, we know Tiny Tim is OK, Bob Cratchit has the disposition to be content, and Mrs. Cratchit will adjust; Scrooge, though, in his Pantalone mask, has a lot of reckoning yet to do. That may be truly said of all of us. God bless us, every one, indeed.